A warm welcome as always to the latest Railwaymedia blog, having managed to miss doing one in January entirely I thought I'd better squeeze one into February, even if only just. I normally try to keep this blog mainly relevant to the railway side of my photography which explains the two month gap between editions as I haven't pointed my camera at trains much since Christmas. This hasn't been a planned policy as such, just with short days, cold weather and a lack of motivation, I have tended on days out to aim for nice warm pubs and so, by necessity, more in the way of bus photography as they tend to be seen more near the area of where the beer is located! 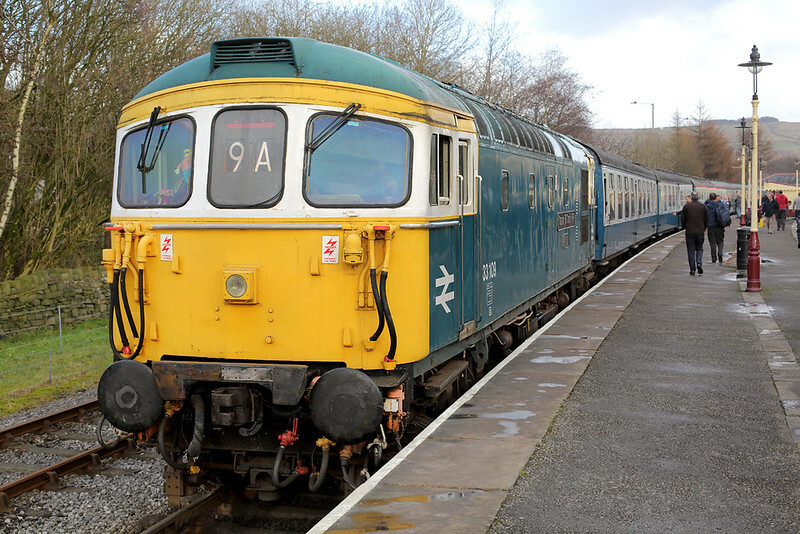 Having said that, my first day out of 2015 was entirely train orientated being a visit to the mini diesel gala that the East Lancs Railway were holding on the second Saturday of January. Being my one day off between two weeks of night shifts, rather than drive I went by bus and train to Bury so I could have a few beers. Even travelling by train it is possible to get some good pictures on this railway by getting off the train at, principally Summerseat and Irwell Vale, but I had already decided to just spend the day travelling up and down in the comparative warmth of the railway's Mk1 coaching stock. 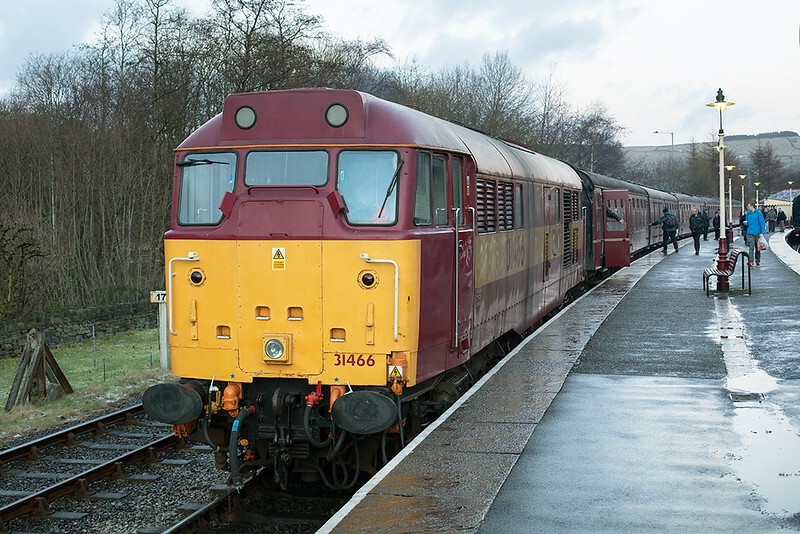 I have anyway got a pretty comprehensive set of pictures over the years from most of the locations on the line, 31466 pictured above at Rawtenstall being the only engine out that I haven't previously photographed. All my East Lancs pictures over the years can be found HERE. I finally managed the following week to get a shot of Arriva Trains Wales' North Wales Coast loco-hauled set stabled for the night at Crewe, usually on my visits it is obscured by Voyagers parked up. I think ever since the start of this second diagram in December 67001 has been in charge but as I write this 67020 has made an appearance, although I understand there are wheelset problems on the Driving Van Trailer for the train which may mean it is substituted by a DMU for some time. After a few bus-orientated trips my next full day out was to Cardiff for a mixture of bus, train and Wetherspoons spotting. The journey to Cardiff was made in luxury, or as much as you can do these days. 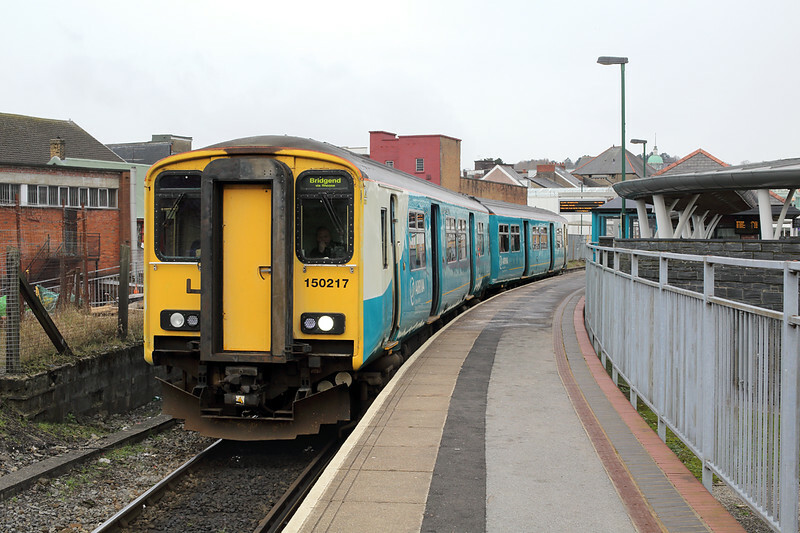 By changing off the 0708 Crewe to Milford Haven service at Shrewsbury and waiting 25 minutes you can travel down on the other Arriva loco-hauled service , the 0533 Holyhead to Cardiff. 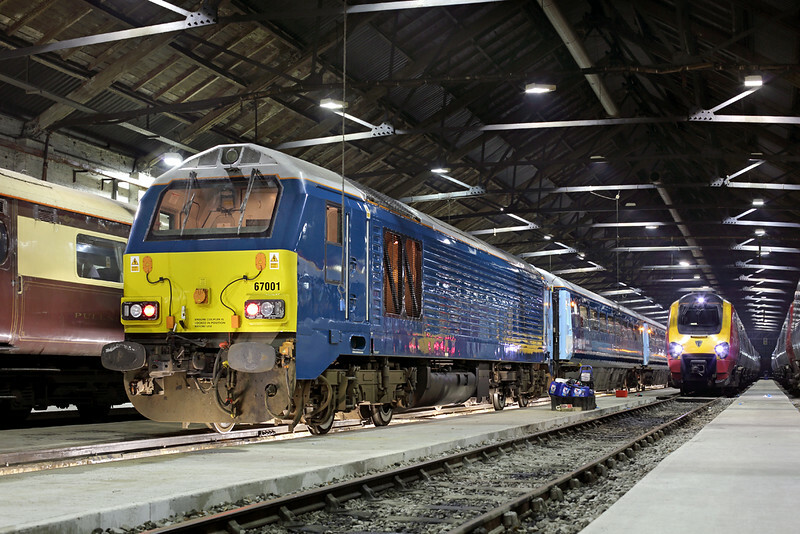 Known as the 'WAG Express' Arriva promote it as their 'Premier Service'. Again it is class 67 hauled with Mk3 coaches and you can buy a full breakfast from the buffet for around £7. Certainly beats travelling on the all-stops class 175 and it reaches Cardiff only a few minutes behind. There was no time to do my remaining three 'Valley Lines', Treherbet, Maesteg and Ebbw Vale, but we did get to do the shortest branch in the area from Cardiff Queen Street to Cardiff Bay. I missed travelling on this when Arriva still ran an elderly Class 121 'Bubble Car' on the shuttle, now it is usually a class 153 on the 12 minute frequency service which takes a wapping 3 minutes end to end. 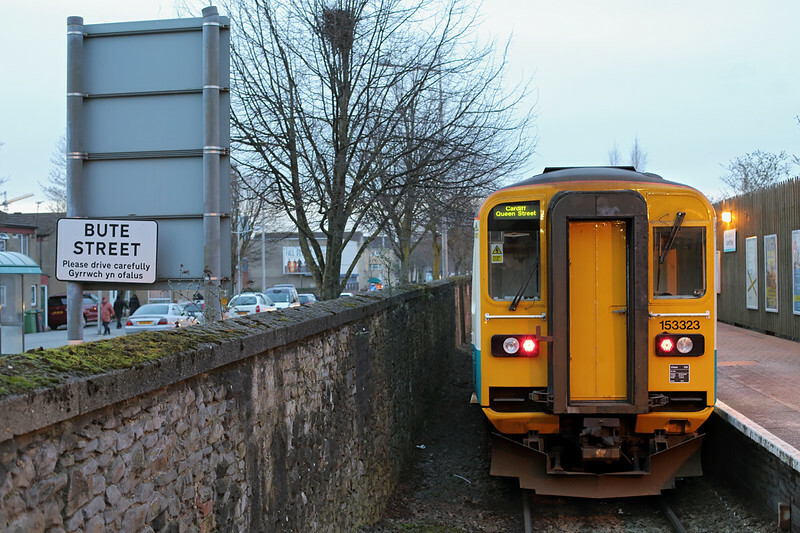 Cardiff Bay station was formely called Cardiff Bute Road before the area was redeveloped into the important business district it now is containing, amongst other things,Welsh Parliament. A reminder to the old station name can be seen on the street sign on the adjacent road. That really concludes the entire railway part of this blog. Throughout the rest of February photography has mainly been concentrated on buses. The following Friday I had organised a trip with a friend to Kent where Stagecoach still runs a sizeable quantity of old Volvo Olympian and B10M buses. I've mentioned visits to the area before and the reason for them being that the PSVAR (Public Service Vehicle Accessibilty Regulations) stipulate that all single deck large buses must be disability compliant from January 2016 and Double Decks the following year. The first low-floor bus in Britain was introduced in February 1998 so any buses built before that, and quite a few after, will have to be withdrawn within the next 11 to 23 months depending on their type. West Midlands Travel was meant to introduce that first ever fully accessible low-floor vehicle, an Optare Spectra double deck, but in holding off to make a big midday launch a small company in Bristol managed to get their Spectra in service in the morning beating the large company to the accolade. The West Midlands bus is still remarkably in service and I managed to photograph that at the end of January. The first of a batch of 20 Spectras delivered they are all based at Wolverhampton and can be seen on a variety of routes operating across the Black Country. Anyway, before I start going too deeply in depth about buses I shall finish. All the recent photographs can as always be found on my New Additions page, other bus jaunts have included St Helens, Southport, Cumbria and a few local ones to me around Preston. I aim to get a few railway pictures taken before the next edition of this blog, I have plenty to aim for now as I have yet to photograph the Colas class 60 hauled Oil Train that runs three or four times a week to Preston, I could do with taking some more pictures of the North Wales Coast class 67 if it is running, Northern Rail are about to launch their 'new' class 319 EMUs on the newly electrified Chat Moss line and I have still not, despite them being out for almost a year, got a picture of one of DRS's new class 68s. Rather than sit on my computer reprocessing old bus pictures I really should check the Real Time Trains website more often to see what is passing through the area. Thanks as always for taking the time to read this, I shall endeavour to write the next one a bit sooner! I shall leave you with a picture that covers both rail and bus photography, the ubiquitous 'railbus'. 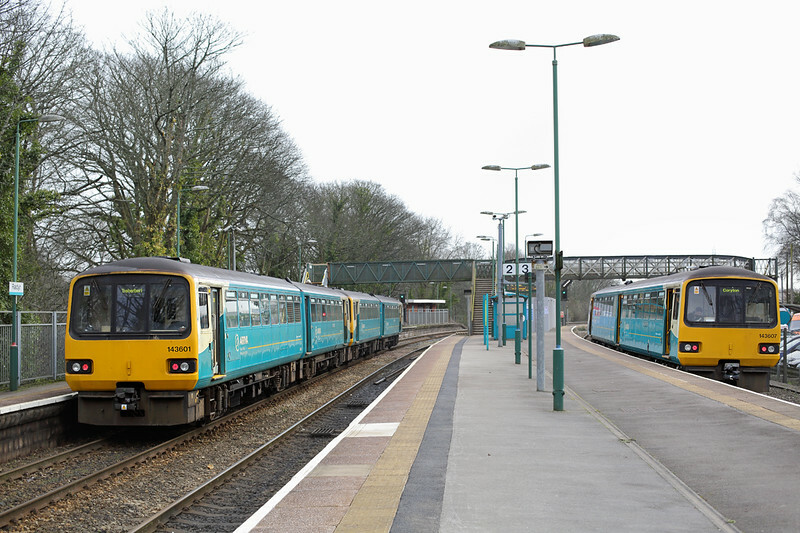 Taken on my trip to Cardiff, Radyr is a good station to photograph the Valley Line units and here a brace of class 143s head towards Cardiff enroute from Treherbet whilst another of the class on the right waits to start its journey the other way to Cardiff via the City Line.